The next-to-the-last big tour I took was the Majestic Circle tour. It was amazing, and possibly the best of all the tours. In it, we circled the whole island of Oahu in a comfortable tour bus. Mike, our guide, was absolutely great. He was a big guy in his 60s, with a beard longer than the Crankee Yankee’s, plus a Santa hat. He had stories to tell all through the trip, which enhanced the whole experience. We enjoyed all the sights on this nine-hour tour; Diamond Head, the Halona blowhole (which, by the way, was not blowing that day), Hanauma Bay, Nuʻuanu Pali, the North Shore, Waimea falls and Waimea Bay. On that day, there were plenty of surfers to watch. We also visited the lovely Byodo-In Temple, a replica of an ancient Japanese temple. We also visited the Dole Plantation and enjoyed some fabulous Kona coffee, roasted macadamia nuts and of course, fresh pineapple. 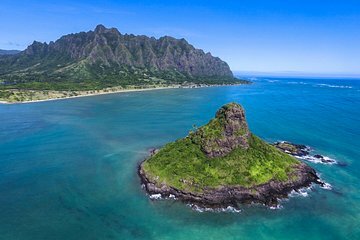 Part of the circle tour, showing the island called Chinaman’s Hat. 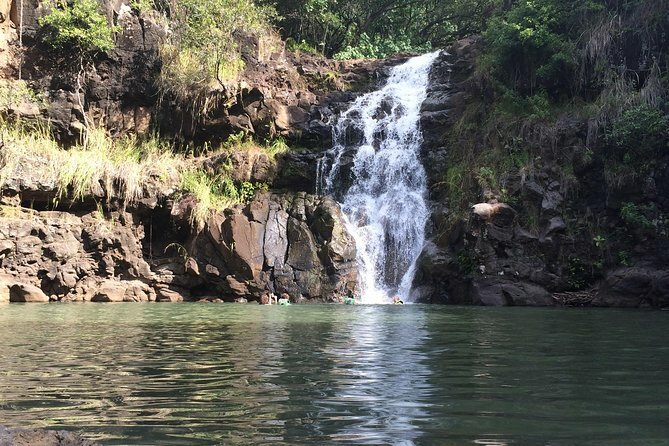 Just walking up to Waimea Falls was a treat in itself; there were flowers and plants and trees, the like of which I have never seen. Honestly, to me it seemed like being in the Garden of Eden. On the way out, I stopped at a table where a young man was sorting and cleaning sea shells. I asked him if the sea shells were native to Hawaii, and they were. In fact, this young man made a living out of diving for them. I bought a beautiful lavender and cream-colored cone shell, which now looks great in my collection. Fine by us all! I ordered garlic butter shrimp, and when we all arrived at Fumi’s Shrimp Truck, I enjoyed the best shrimp I’ve ever had. It came with two small scoops of sticky rice and oddly, canned corn. But it was all delicious.